I admit it, I have a tab problem. As a web worker, it’s not uncommon for me to have over 100 browser tabs open throughout the work day, and at that point Google Chrome eats up about 6.5GB of RAM and starts swapping heavily, slowing down OS X. Chrome is no doubt better at handling this many open tabs than Safari or Firefox, but it’s still a hog as each individual tab sits in active memory, slowing down both the Mac and Chrome itself. Here is what a short generated tab list looks like for a window group. 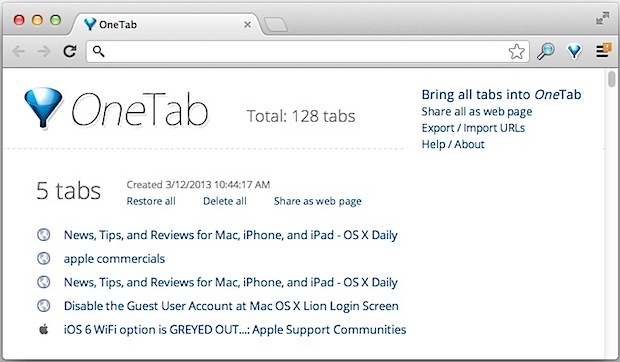 Notice there is also a listing of the total tabs (128! ), all of which are available by scrolling through the list to different groups. The saving options are visible in the upper right corner, and restore functions are listed under each tab grouping. Because OneTab is just a browser extension for Google’s Chrome browser, it’s completely cross platform compatible, so you’ll be able to use it in Mac OS X, Windows, Chrome OS, or whatever else you happen to be running Chrome on, so long as it supports browser extensions. So does it actually save up to 95% of RAM? That’s obviously a bold claim, but I can confirm it works if you have tons of tabs open and you use it to it’s full effect, reducing everything into a single link list and then having just a few tabs open that are needed right at this moment. In testing I got Chrome from using 6GB of RAM to just 350MB, a whopping reduction. It can also free up CPU cycles since you won’t be swapping with heavy RAM use any longer, and any tabs running Flash, Java, or AJAX in the background will also be put to an end. To free up even more memory after using OneTab to generate the link list, follow it up with a quick usage of the (controversial) purge command, which should free up another 200-500mb of RAM in most cases as it dumps additional caches from memory. OneTab is a great addition and if you’re staring at a screen full of tabs and looking for a simple way to manage them while freeing up system resources, this just may be the solution you’ve been looking for. Really the only thing that would make it better would be built-in cloud sharing and syncing features, so that a OneTab list from one computer would automatically sync with another computers without having to manually export it. Nonetheless, it’s highly recommended as is, so check it out. I started declaring tab bankruptcy at the end of each day. If it’s still open and I want to read it, I send it to Pocket. Otherwise it’s all closed out and I start fresh. Yes you lose out on potentially good data, but 128 tabs? You’ll never get through those. That’s like 128 new emails waiting to be responded to. Ignore it all and start over, if it’s important you’ll find it again, just like email. Personally I would find OneTab more useful as a tab archiver service, maybe export all the links to Evernote and save them for a rainy day. Completely agree. There is nothing worse than coming to work the next morning with a face full of yesterdays droppings. Start fresh, you will be more productive. If your room is a mess, buying a bigger cupboard is not the right solution. Best way to manage Chrome is to use Safari. LOL, fair advice and Safari is a great browser. Unfortunately in my experience, Safari doesn’t perform well with tons and tons of tabs. The TO is really awesome – highly recommend. My vote on tabs management extensions goes to Tabs Outliner. Just watch it’s video on Chrome WebStore and you’ll understand how powerful it is.